Ten years after the events in Part 3, Andrew Yong (Shen) is touring with his memoir, “I, Survivor,” recalling events that made him a tabloid news story and suspected serial slasher for ten years. As is par for the Hatchet course, we see horror legends and genre actors sprinkled throughout the cast. Infamous as Angela from Sleepaway Camp (1983), Felissa Rose is hilarious here as Andrew’s pill popping agent Kathleen, and within minutes she’s on screen with a “member” of the cast! She convinces Andrew to leave his book tour and fly back to the swamps of the bayou in New Orleans one last time, on the promise of a big payday for the live broadcast of a Crime TV series. Their plane crashes in the swamp right as a young group of filmmakers arrive there to film a teaser trailer for their own upcoming Victor Crowley film. I don’t have to go into more details do I? If you’ve seen any of the Hatchet films, the plot essentially writes itself from here. Hodder, the only repeat Jason in the Friday the 13th franchise ties his Jason record in this, the 4th Crowley film. Hodder (who also appears in the earlier films in flashbacks as Victor’s father) proves again that he’s more than just a stuntman in heavy makeup. Even under all prosthetics, he plays Crowley with a physicality and glinting humor that you don’t normally get from most monsters. And there’s no one better at killing on screen. There is one kill so hilariously over-the-top that it ranks near the top of the whole series. The rest of the cast helps elevate this from the usual trappings of “franchise malaise,” and Green makes really great decisions in casting, writing, and direction that help defy the conventions and trapping of past slashers. Parry Shen is so unlikely as a lead horror hero that you can’t help but root for him. Green describes him as his “secret weapon” in an interview featured in the extras. Laura Ortiz (Rose), who works on Green’s TV series Holliston, is fantastic as the sarcastic would be side character who becomes stronger as the film goes on. And nearly stealing the movie is Dave Sheridan (Dillon) as a wannabe actor/tour boat driver. He has a scene trying to call for help on the plane’s radio that had me rolling. 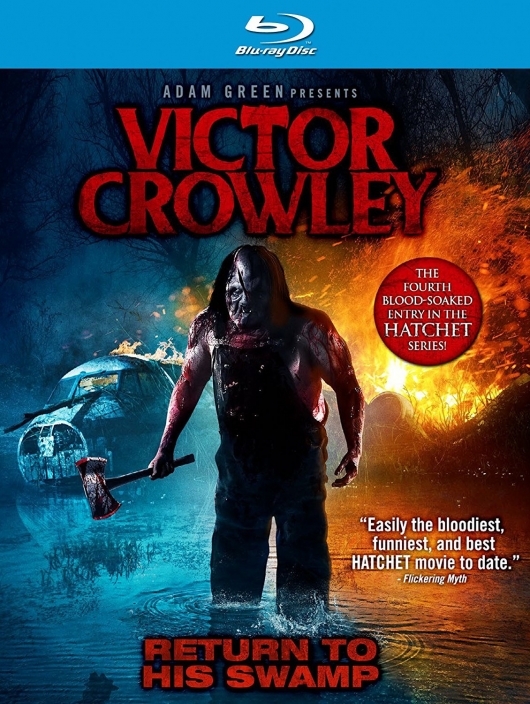 Overall, Victor Crowley is exactly the film Adam Green set out to make and exactly the film I, as a horror super geek and fan of Hatchet series wanted to watch. 85 minutes of blood spraying from severed limbs, ingeniously creative kills using tremendous practical effects, and sarcasm laced humor filled with in-jokes and references for the audience. This is definitely worth you time and money. The Blu-ray comes two commentary tracks: One with Green and the cast, and the other featuring the crew including makeup FX artist Robert Pendergraft. There’s also a great “Behind the Scenes” featurette, as well as long interview with Green where he goes into details about the personal tragedies leading up to his decision to revisit Crowley, and then the making of the film. Having interviewed him, Green just comes off as a really genuine guy and someone you can root for as a filmmaker. Victor Crowley is available on Blu-ray/DVD combo pack and VOD now.